Thursday’s session saw world markets focused on the potential for a June interest rate hike in the US. As analysts and investors weighed the likelihood following hawkish tones from the Fed, caution meant losses for most of the major indexes. The Toronto Stock Exchange’s main index was down slightly but losses on Wall Street, Europe and Asia were larger. Japan was the outlier with a stronger US dollar boosting its exporters. Oil prices were slightly lower by the end of the session as the greenback continued to gain but data showing a higher gasoline draw in April and concern over Nigerian supplies helped support prices. While there is much talk of a US interest rate rise (or possibly 3) in 2016, analysts polled by Reuters are not expecting any change in rates for Canada. 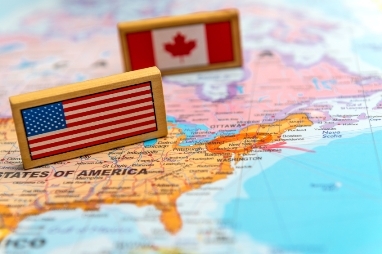 The Bank of Canada may be cautious about growth when it makes its May statement, with the oil industry now impacted by production curbs due to the wildfires as well as lower prices; however, a cut is not expected by experts. In fact, the next move by the BoC is likely to be a rate rise, the poll showed, but not until the third quarter of 2017. Statistics Canada said Thursday that Canada’s wholesale trade declined by 1 per cent in March to $54.6 billion. It was the second consecutive monthly dip. Motor vehicle and part sales and miscellaneous sectors led the decline but a total of five of seven subsectors were lower. In volume terms wholesale sales were down 0.4 per cent. It’s time for Blackberry to get out of the device business according to Macquarie Capital Markets Canada analyst Gus Papageorgiou. He believes that the software and services parts of the Waterloo firm will start to generate profits but not for some time yet. Until then, investors should sell their Blackberry stock, he said in a client note Thursday. The firm’s CEO John Chen has stated his aim to make the devices unit profitable but Papageorgiou believes shutting it down would make a better decision to allow the leaner remaining business to grow.